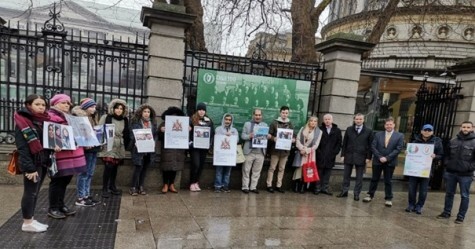 On 24 January 2019, the Gulf Centre for Human Rights (GCHR) in co-operation with human rights partners, Americans for Democracy & Human Rights in Bahrain (ADHRB), Amnesty International, the Bahrain Institute for Rights and Democracy (BIRD), and Front Line Defenders organised a solidarity gathering in front of Dáil Éireann (the Irish Parliament) in Dublin. GCHR Executive Director Khalid Ibrahim, who attended the gathering, called on the Government of Bahrain to meet its human rights obligations and release all detained human rights defenders in the country, including GCHR’s Founding Directors Abdulhadi Al-Khawaja and Nabeel Rajab. They have recently been prevented from physical contact with their families during visits, after a new regulation ordered visits take place behind glass barriers. Maureen O’Sullivan TD, Niall Collins TD, and Seán Crowe TD, members of Dáil Éireann, participated in the gathering and showed their solidarity with the people of Bahrain by calling for the immediate release of all detained human rights defender and other activists. Protestors called for the release of Ali Al-Hajee and Naji Fateel, a human rights defender serving 25 years in prison, who have been on hunger strike for over 70 days and are in very poor health. They have been protesting to gain access to urgent medical treatment. Last week, Fateel began to reject anything other than water. Other detainees include human rights defender Dr. Abduljalil Al-Singace and three family members of Sayed Ahmed Al-Wadaei, Director of Advocacy of BIRD, who have been sentenced to prison as a reprisal against his advocacy activities in the United Kingdom. His mother-in-law Hajer Mansoor, and two other women human rights defenders Najah Yusuf and Medina Ali, were badly beaten in September 2018 after protesting conditions in Bahrain’s Isa Town Prison for women.